Key difference: Plastic is a type of polymer. Plastics are made up of long chain polymers, whereas polymers are composed of small fragments known as monomers that are joined together in a long chain. Generally, the materials which are commonly referred to as plastics are all considered polymers, but polymers don't necessarily have to be plastics. Now, this is quite confusing, but the differences are easy to understand. The term ‘polymer’ is commonly used today in the plastics and composites industry, and it is often used to imply the meaning of ‘plastic’ or ‘resin’. However, the term is just a component which is used to synthesize plastic. A polymer is chemical compound where molecules are bonded together in long repeating chains. 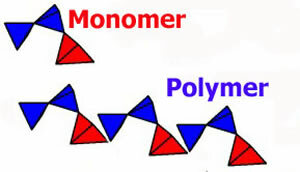 Polymers are large molecules, which comprise of repeating monomers in a single structural unit. These monomers are bonded together by covalent bonds to form a polymer. Polymers have very different physical and chemical properties than their monomers. Moreover, they have unique properties and can be tailored depending on their intended purpose. There are two main types of polymers which are synthesized according to the different methods. In a reaction, when the monomers form double bonds with the given carbon atoms, these new polymers are called as addition polymers. Another type is condensation polymers, where the two monomers are joined and the water molecule is removed. Also, there are man made and naturally occurring polymers. All these polymers are widely used for different purposes such as adhesives, lubricants, paints, films, fibers, plastic goods, etc. Plastics, on the other hand, are defined as semi-organic materials which are derived from oil or petroleum. They have a polymeric structure, and are classified as synthetic and semi-synthetic polymers. 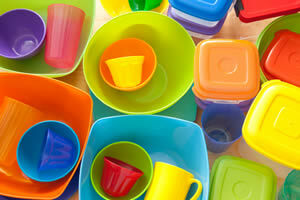 The term ‘plastic’ is commonly referred to as polymers, as they are made of polymers. It is widely used in different forms, such as bottles, bags, boxes, fibers, films, etc. It is produced by both condensation and addition polymerization reactions. Also, depending on the way it is polymerized, the properties of the synthesized plastic can change, and the polymers can be cross linked to each other in the process. Plastics are further classified as thermosetting polymers and thermoplastic polymers. Thermosetting polymers, also known as thermo-sets, solidify into a permanent shape. They are amorphous and considered to have infinite molecular weight. Thermoplastics, on the other hand, can be heated and remolded over and over again. Some thermoplastics are amorphous, while some have a partially crystalline structure. Polymers are defined as long chain compounds made up of many small repeating units called as monomers. Plastics are defined as semi-organic materials which are derived from oil or petroleum. It is made of small monomer units. It is made of long chain polymers. It has a monomer structure. It has a polymeric structure. There are many types of polymers. It is a type of polymer. It is used in adhesives, lubricants, paints, films, fibers, plastic goods, etc. It is used in bottles, bags, boxes, fibers, films, etc.